The Bronte Legion is self-funded by its membership and through fundraising efforts and the Poppy Campaign, the Legion looks after the needs of veterans, their dependents, as well as those still serving in the Canadian Forces. The Legion has service officers who set veterans up with Veterans Affairs Canada and help with their hearing, rides to doctor’s appointments, etc. There are also bursary programs for veterans’ children and many kids have gone to school with the help of Bronte Legion. In addition to this work, the Legion also does a lot for the community that most people don’t know about. Bronte Legion funds youth programs, gives out food vouchers to needy families at Christmastime, provides the Hall for meetings or community charitable events, and helps countless community members in need. Years ago, there was a family whose home was burned on Mississauga Road. 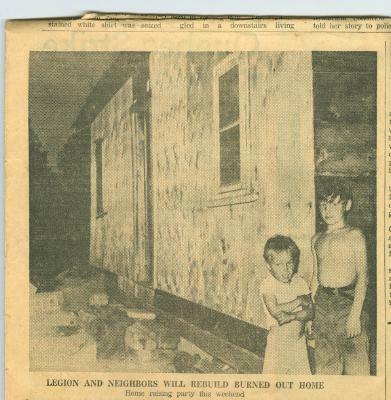 According to Past President Gene Reed, the Legion “rebuilt that house in 4 days.” On the right is an article from the Oakville Journal-Record that featured this story. “Bronte Legion started the movement to aid Donovan rebuild his home but was told by the Oakville Building Department that the old structure was too far gone to be rebuilt.